Going back and forth with potential clients can be exhausting. There are so many questions to answer, and so many things to explain. Sure would be nice to have a way to streamline that. Oh hey! That’s what an intro packet is! What is an intro packet and why would you want one? When working with clients, it’s important to outline the process and let clients know what to expect. This keeps clients from getting antsy if they don’t hear from you for a few days, and lets them know what they need to provide and when. An intro packet includes all of this important information, and allows you to spend more time working on projects, and less time answering questions. 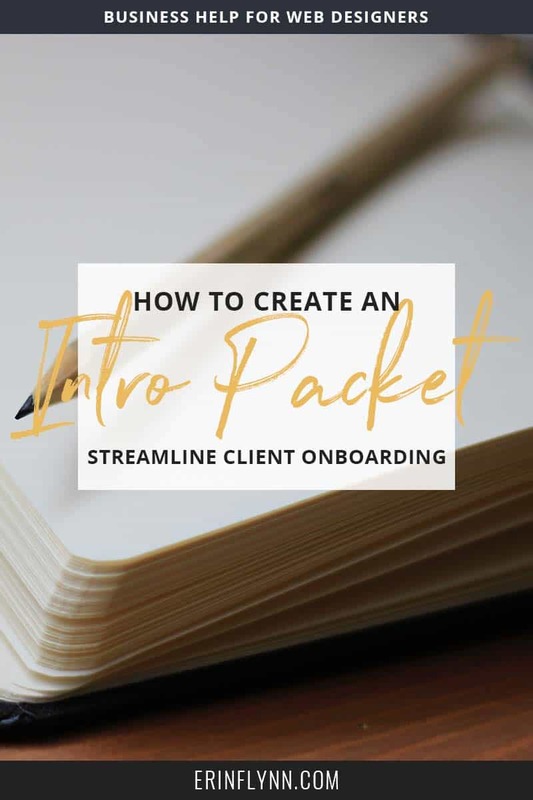 In the workshop, we cover all the essential information you should include in an intro packet, but overall, an intro packet is the place where you give clients a great introduction to working with you, while screening out people who just aren’t going to be a good fit. What’s the difference between an intro packet and a welcome packet? You’ve probably heard of a welcome packet before, but it’s not the same as an intro packet. The major difference is that an intro packet is designed to be sent BEFORE you and a client sign a contract. It helps weed out clients who are not a good fit for you. I recommend sending the intro packet shortly after getting the initial inquiry, and before spending time quoting or Skyping with a potential client. Think of the intro packet as the big picture—don’t waste time with tiny details that the client doesn’t need to know yet (like how to actually use your project management system), just outline the big stuff that is make or break for working with you (like that you will require them to use a project management system with you). An intro packet should include basic information that doesn’t change from like-project to like-project. For example, if you’re a web designer, you may have a variety of websites that you work on, but overall, the process should be the same whether it’s a simple blog, or a large e-commerce site. If you offer multiple services that have different processes (e.g. you offer both web design and consulting services) you’ll need to make an intro packet for each, but keep things simple by re-using information whenever possible (like your office hours). Below is the basic outline for all intro packets—feel free to add information or rearrange according to your industry. This is enough to cover the majority of questions you get, and weed out those who don’t agree with your policies, before you waste time going back and forth with them. This is a great way to inform potential clients about what it’s like to work with you (and get the right people excited about it), and alleviate most of the major concerns they have. At the same time, it makes YOUR life easier, because you don’t have to start at the beginning every single time. Intro packets don’t just help you, they help potential clients determine if you’re a good fit for them. By answering a lot of questions upfront, outlining your policies, and sharing your process, both you and the client are able to screen each other, with little effort on your part. Stop wasting time going back and forth in emails, create your intro packet today! Ready to create your own Intro Packet? Are you ready to automatically screen out bad clients, and get great clients excited to work with you? Learn how in my signature course, Streamline Design Profit!